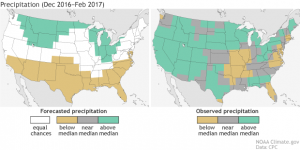 Climate and Agriculture in the Southeast | How did NOAA’s winter forecast compare to the observations? How did NOAA’s winter forecast compare to the observations? Many weather forecasters never publish stories of how their forecasts verified, although many of the best ones will take the time to discuss what went wrong when the forecast seriously busted. Here NOAA provides us with a look at how their winter forecast did compared to what they predicted last year. 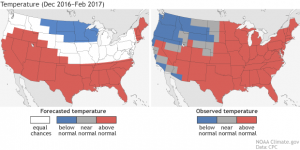 You can read their discussion at https://www.climate.gov/news-features/blogs/enso/winter-outlook-2017-%E2%80%93-how-did-we-do. I don’t post forecasts from the Old Farmers Almanac here because I think they are a bunch of hooey, but if you care to check I think you’ll see that NOAA did better than they did in most areas of the country. You won’t see them posting their comparisons, though. Posted in Climate science, Climate summaries, Uncategorized. Bookmark the permalink.